Tintin Heart: Love Paints - Crafty Bloggers Network Challenge. 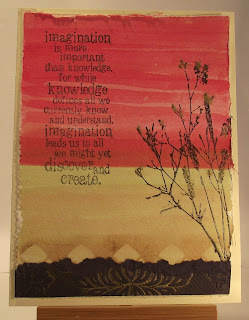 today I am posting my DT card for the The Crafty Bloggers Network new challenge starting today. The challenge theme is 'Love Paints' and you are encouraged to get out the paints, acrylic, watercolours, water-based pens etc and just create! Take a trip over to the challenge blog to check out the other FAB DTprojects and join in with us. I've used a 14.5 x 10 cm piece of watercolour paper and 'washed' in broad lines of deep pink and light brown waterbased inks. I allowed each 'wash' to dry completely before adding more layers of colour. I like the effect you get with the tone-on-tone adding of more layers. For added texture a strip of navy paper, with a gold embossed design was adhered at the bottom. The quotation and branch stamps from Tim Holtz, stamped in black complete the card. Thanks for visiting and reading my blog. Your time and comments are appreciated.